Miniatures gaming with all the serious mucking about taken out and all the fun left in. What a great sound: a handful of dice being thrown across a plastic board. That’s not the only thing that brings back vivid memories of childhood when you play Heroscape, a return to ye olde days of big games with lots of plastic components. Sure, open that big brightly coloured box, see all the plastic bits and you might think we’re starting to cross over that nebulous line between game and toy here, but the important thing is, is it fun? You bet it is. If you used to play miniatures games but rapidly got sick of spending valuable game time reading all those intricate rules, mucking about with tape measures, and painting figures, then this is the game for you. Our first game was a fast and furious battle that came down to a close fight between our last two figures; and if you don’t enjoy a slug-a-thon between a WWII paratrooper commander and a robot that looks like it wandered off an episode of Dr Who, you’re not going to enjoy this game. Yep, the background rationale is flimsy—warriors gathering in Valhalla to slug it out over some mystical Wellsprings—but that’s not what this game is about. 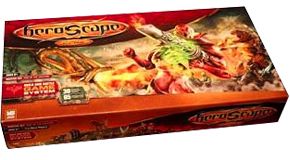 Hasbro were onto a winner with Heroscape’s flexibility and expansion potential, and many waves of extra figures soon followed the Master Set onto the shelves. I love your summarized rules! Could you add the rules for specialty terrain such as lava and snow? I don’t have them. If you do, contact me via my contact form and I’ll see what I can do.